Sift all the dry ingredients into a large bowl. Set aside. Blend all the wet ingredients together and fold into the dry. Pour into a lined 8" round cake pan. Bake for 40 to 50 minutes or until a stick inserted into the center comes out clean. Remove from the oven and place on a cooling rack to cool completely. Bring heavy cream in a saucepan on medium heat to simmer (don't boil). Pour over chocolate chunks and whisk until chocolate mixture is smooth and shiny. Pour over the cake. 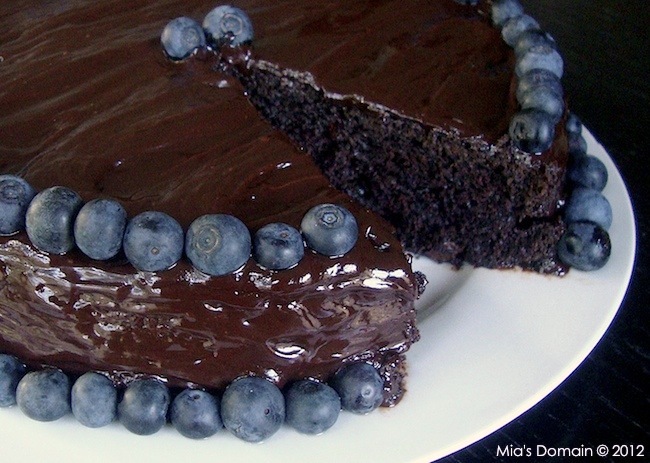 Decorate with fresh blueberries. Yay! A gluten free cake without almond flour! Its gets so discouraging trying to be gluten free when almond flour is used in so many recipes. Thanks for this!